- Koji production -The first key step for making soy sauce. Let me show you Koji production, which is one of the most important processes of soy sauce production. 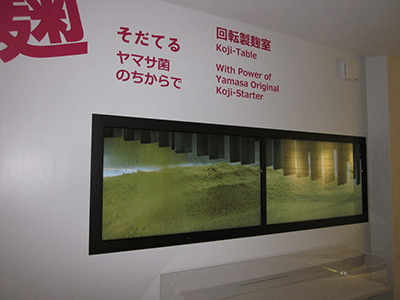 The equal volume of steamed soybeans and crushed roasted wheat are mixed, then purely cultured seed Koji-mold are added to the mixture in the Kojimuro(=Koji-mold culturing machine). How long is the mixture kept in the Kojimuro ? The mixture is kept in this room for three (3) days. During these three days, the mixture are automatically crushed into small pieces under the control of fresh air and constant tempereature and humidity, so that we can hasten the growth of Koji-mold and obtain the best quality soy sauce Koji. 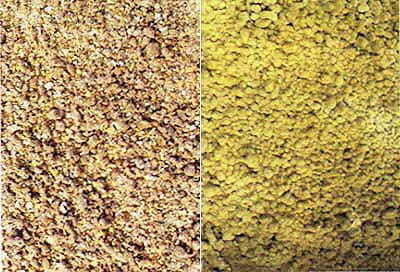 Immediately after Koji mold is added to soybeans and wheat (left) and Koji three days after Koji mold is added, which is completely covered with Koji mold (right). So, Koji production is the beginning of soy sauce production, right ? What is Koji mold ? Koji mold is a kind of mold rich in enzymes that changes soybeans and wheat into tasty soy sauce. It is also used to make Japanese traditional fermented products such as sake (rice wine), sweet sake(Mirin) and soybean paste. Soy sauce manufacturers use different kinds of Koji mold, and the one Yamasa uses is called Yamasa's Aspergillus. It has been used since the Edo period (1603-1867), and has long been improved for making soy sauce with better aroma and flavor.